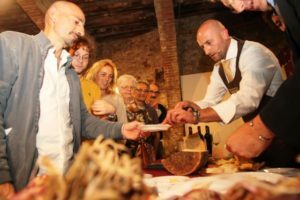 Located upon a hilltop in the medieval town of Certaldo Alto, the food festival Boccaccesca will take place on Friday October 2, Saturday October 3, and Sunday October 4. Creative director Claudia Palmieri started the weekend-long festival with the aim of bridging the knowledge gap dividing culinary professionals and the general public. Boccaccesca, named in honor of Certaldo native Giovanni Boccaccio, author of the Decameron, is designed to encourage visitors to walk into the festival with an open mind to trying new delicacies and exit with newfound knowledge. 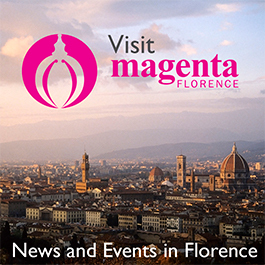 Located both on the city’s medieval hilltop stretching down to the modern lower city called Certaldo Basso, this seventeenth annual festival is the first with free admission. Activities vary between Friday, Saturday, and Sunday but most are available all three days for everyone to enjoy. The first highlight of the weekend is a local Farmer’s & Crafts Market – located at both the hilltop and lower part of the city – that begins at 11 am and runs until 10 pm. Local exhibitors will be selling their fresh produce and one of a kind crafts that can not be found anywhere other than in the heart of Tuscany. Along with the market there will be Street Food Trucks located at Chiesa S.S. Tommaso e Prospero for a chance to try dishes from Tuscany and various Italian regions. Wine tasting opportunities will be also be available all throughout to complement the delicious, authentic food. Not only will there be plenty of Italian cuisine to go around, but Food from Around the World, specifically from sister countries Japan and France will showcase their country’s signature dishes. These, along with specialties originating from the Marche region of Italy, can be found at the Piazzetta Vittore Branca. All weekend-long, Leonardo Romanelli and renowned chefs will hold food demonstrations at the breathtaking city’s hall garden located at Palazzo Pretorio at 12 noon, 3, 5, and 7 pm, providing an opportunity to witness preparation as well as to be a guest at the table. Circus performers from Certaldo’s summer street theatre festival will make appearances throughout Boccaccesca. At 11 am, students from the Tuscan hotel schools will have a cookoff to see who can make the best antipasto, main course meals, and desserts with this year’s rice challenge. Boccaccesca has events catered for toddlers as well. In Palazzo Pretorio garden at 3 pm, children can enjoy Traditional Tuscan Children Snacks to get a taste of what their nonnas (grandmas) were eating at their age. Following the traditional snacks event, there will be a variety of Children’s Book and Game Workshops at 5 pm in the courtyard for young attendees to further enjoy themselves. On Sunday October 4 at 5 pm in the The Palazzo Pretorio Courtyard will host a Slow Food Seminar (5 pm) presented by Enrico Roccato, a representative of the Slow Food Movement, who will educate the public on the effects of wasting products and what it takes to truly abolish the “fast-food” way of eating. At 6 pm there will be Il Pane delle Donne , a bake-off amongst women to see who makes the best home baked bread.